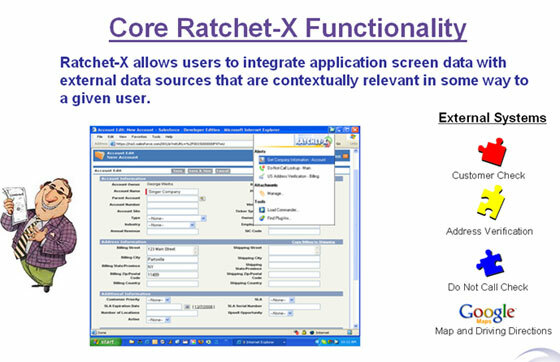 Ratchet-X from Manhasset, NY based RachetSoft is a XML-based desktop integration solution that provides the ability to expand and enhance information access to existing applications by providing cross application support. Anyone who has ever worked in corporate IT support knows the problem. Data across across multiple platforms often lacks interoperability. Fragmented data can result in lost productivity and lost opportunities. Ratchet-X is a platform that provides a set of integration capabilities that allows users to integrate any application with other systems, applications and data sources in their IT environment without requiring changes to the application. Ratchet-X is a short cut that aims to remove the need for cumbersome cutting and pasting of data. End users, without the assistance of a programmer, can automatically integrate functionality into an application so that data transfer takes place precisely when and where the user needs it. The process starts by creating an Appspace, an XML file that describes your applications screen in terms of how to recognize it and what kinds of data are contained on them. Alternatively, preconfigured Appspaces are also available. Once the Appspace is defined, Ratchet-X will recognize the application screen anytime it’s visited and notify users what features it can add to the application. Once a feature is selected, Ratchet-X extracts the appropriate data from the application screen, performs the requested function and pastes the results into either the originating or any other application screen for which an Appspace exists. Whilst this sort of tool is not new, it’s the first I’ve seen that brings data mashups to desktop users with support for all applications as opposed to a defined few.